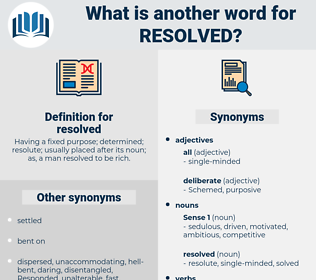 What is another word for resolved? 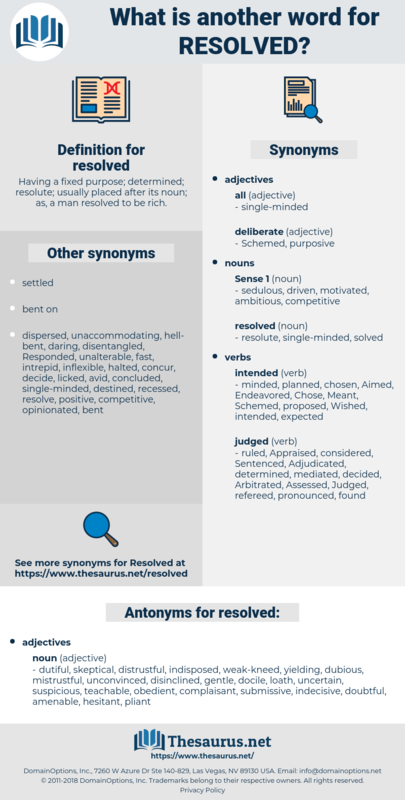 Having a fixed purpose; determined; resolute; usually placed after its noun; as, a man resolved to be rich. resolute, unresolved, committed, determined, decisive. resolving, caveats, cautions, determined, finalized. Responded, approved, Arrived, ascertained, cleared, Adjudicated, involved, proposed, decisions, reset, moved, handled, Reimbursed, Arose, ordered, selected, replaced, concluded, Dealt, rule, ruled, Worked, decides, established, Chose, endorsed, Avoided, adjusted, identified, Reached, Recruited, Discussed, suggested, triggered, Were, ended, elected, hired, Undertook, specified, broke, Voted, wrapped, Came, directed, Commenced, appointed, Vowed, contracted, initiated, cracked, Embarked, controlled, Instituted, transmitted, Envisaged, unleashed, sliced, defined, adopted, faced, attended, opted, Happened, Encountered, found, engaged, Incurred, Began, started, deducted, Passed, Brought, Hashed, held, Deemed, put, planned, Spanned, said, Launched, Met, stated, added, Accounted, wanted, thought, cut, made, committed, determined, pledged, finalized. removed, relieved, restored, reconciled, overcome, Responded, addressed, recovered, redressed, observed, reversed, responses, rehabilitated, Averted, governed, approved, saved, rectified, Served, re-established, improved, corrected, alleviated, regularized, Investigated, solutions, response, discovered, Explored, Arrived, regularised, resorbed, Confronted, severed, Replied, ascertained, clarified, cleared, repaired, Regulations, reinstated, overwhelmed, Repaid, Adjudicated, restated, Administered, involved, guaranteed, evaluated, regulated, Erased, Revoked, Negotiated, accomplished, recorded, left, reported, derived, proposed, implemented, moved, organised, reintroduced, located, Resulted, handled, Answered, released, Dispelled, dismantled, conquered, Managed, Repealed, stopped, Achieved, Delivered, Explained, characterized, Resumed, Eradicated, supported, Rendered, Elucidated, Referred, treated, motivated, ordered, selected, regulation, interpreted, expressed, finalised, Construed, disaggregated, reviewed, pursued, received, realized, Eliminated, surmounted, unanswered, asserted, driven, calibrated, Assuaged, Waived, cured, unsolved, decision, Overtaken, concerned, sorted, arranged, declared, countered, destroyed, cancelled, covered, lost, concluded, considered, promised, rid, allocated, acknowledged, Dealt, dissociated, mitigated, Accommodated, eased, Prevented, withdrawn, Calmed, Liquidated, Helped, deferred, separated, rule, ruled, Worked, split, collected, chosen, organized, Assessed, composed, Superseded, established, measured, terminated, balanced, authorised, endorsed, Allayed, Litigated, Avoided, reduced, processed, poised, enclosed, sealed, Abolished, Contributed, developed, Extracted, Disappeared, adjusted, remediated, identified, Performed, opposed, understood, fulfilled, Extirpated, filled, Reached, discontinued, Recruited, Prompted, tailored, Unliquidated, Discussed, serviced, calculated, Legislated, informed, suggested, Disbursed, Deleted, given, unblocked, distracted, crossed, absorbed, enlightened, Excavated, sought, narrowed, Surpassed, outlined, Caught, Been, Operated, pronounced, pleased, Examined, arrested, presented, Transferred, imposed, divided, Screened, gotthis, Contended, ended, amended, Remained, elected, ironed, opened, vanquished, Undertaken, hired, prepared, broken, specified, satisfied, Looked, Combated, described, Attributed, posed, Urged, assisted, Generated, Surveyed, Complied, come, suspended, seized, Disbanded, Voted, confined, voiced, Provided, led, halted, Offered, directed, Adjourned, Exercised, topped, Enabled, dismissed, Earmarked, Suffered, spoken, appointed, noted, obligated, contracted, flattened, Had, Stipulated, varied, lifted, struck, initiated, cracked, furnished, employed, Subsided, designated, Enacted, Influenced, shaped, Submitted, Embarked, controlled, accepted, unsettled, legalised, finished, Instituted, transmitted, prescribed, acquired, exhausted, interviewed, owed, risen, sliced, vanished, Viewed, educated, defined, Insisted, discarded, Conformed, scheduled, focused, conducted, used, decreed, Warned, Excreted, adopted, laid, raised, outdated, faced, contained, Approached, weathered, amassed, attended, heard, unloaded, opted, Argued, cushioned, Obtained, Targeted, geared, Bridged, acquitted, permitted, Supplied, Encountered, actioned, Allowed, tested, timed, listed, touched, Switched, found, mandated, intended, Challenged, engaged, Judged, granted, discharged, Caused, Begun, Incurred, Introduced, Captured, admitted, Aimed, expanded, known, failed, deducted, Exceeded, tried, HIT, Passed, Awarded, designed, Fought, Brought, bound, defeated, felt, Carried, Entered, faded, beaten, held, Subjected, Deemed, Asked, effected, included, studied, placed, staffed, Rated, gone, Demanded, put, attached, planned, dropped, taken, Spanned, figured, marked, Claimed, fenced, signed, 2004, run, Shifted, tuned, Acted, kept, Met, stated, thinned, Attacked, Gained, funded, won, Accounted, done, Got, thought, cut, made, resolute, committed, determined, pledged, finalized. dutiful, skeptical, distrustful, indisposed, weak-kneed, yielding, dubious, mistrustful, unconvinced, disinclined, gentle, docile, loath, uncertain, suspicious, teachable, obedient, complaisant, submissive, indecisive, doubtful, amenable, hesitant, pliant, vacillating, wavering, reluctant, unsure, pliable, faltering, compliant, tractable. I am resolved now to aim at it. And they resolved to use all means in their power to meet here every morning.